Designing interesting problems and writing assignments is one of the chief tasks of all teachers, but it can be especially challenging to translate and apply learning theory, good teaching techniques, and writing assignments into STEM and other quantitative disciplines. Student Writing in the Quantitative Disciplines offers instructors in math-based disciplines meaningful approaches to making their coursework richer and more relevant for their students, as well as satisfying institutional imperatives for writing curricula. 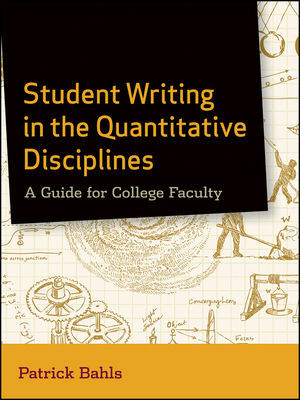 This important resource provides instructors with the hands-on skills needed to guide their students in writing well in quantitative courses at all levels of the college curriculum and to promote students' general cognitive and intellectual growth. Patrick Bahls is an associate professor of mathematics at the University of North Carolina, Asheville, where he also performs research in math and writing and has helped to lead his campus's writing intensive program.